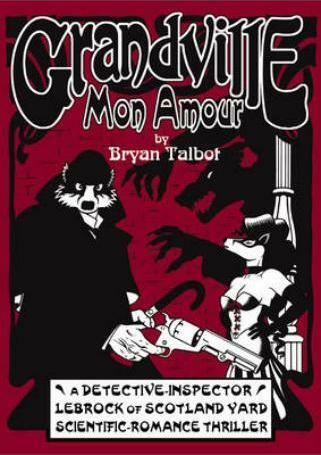 The first six pages of anthropomorphic steampunk graphic novel Grandville Mon Amour have been made available. Written and drawn by Bryan Talbot, it is the sequel to Grandville, set in a world populated by anthropomorphic animals, where France won the Napoleonic Wars and the world is full of steam-powered technology. The story takes place three weeks after the first book, in which badger hero Detective Inspector Archie LeBrock of Scotland Yard is working outside the law after resigning from his job after a row with his boss and is wracked with remorse after failing to prevent the death of a loved one. LeBrock, and his rodent assistant Detective Roderick Ratzi, go on a mission to redeem themselves after they learn that LeBrock’s old adversary, psychopathic terrorist Edward "Mad Dog" Mastock, has escaped from his guillotining at the Tower of London. Grandville Mon Amour will be published in the UK by Jonathan Cape in November. This looks really interesting. If only the stupid US would have more things like this, there is no public actions other than the conventions. Thats why I plan on moving to the UK. Also, the economy is not going to get better in the US, only worse. You'll regret it when you arrive and find out there is no money left in the entire country. Well, i guess you're right, but i guess there is no money anywhere right now. I would probably go there on vacation at most. I'd like to see something else than the US once in awhile.